Summer, 1978 As you can see, I'm well on my way to a complete collection of Star Wars stuff. 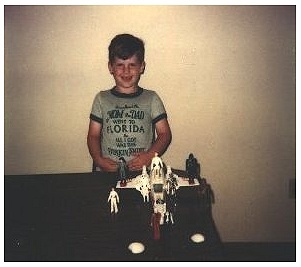 This picture was taken the day I got my x-wing fighter, shortly after my parents returned from a trip from Florida (note the seashells and the shirt). I'm still missing the elusive Jawa and Tusken Raider. I also don't have a TIE Fighter yet, but this was because my cousin had one and I could always play with hers when we were hanging out together. I'm not sure if this was Christmas or my birthday, but judging from the size of this gift, I'd say Christmas. Imagine my surprise when hearing over and over in the store how expensive this was and that I'd never be able to get it. 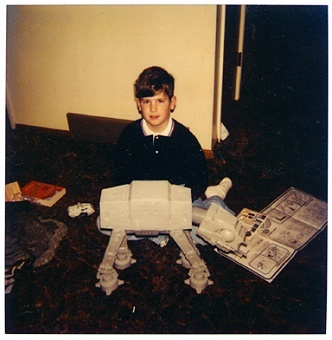 I had completely resigned myself to not having this ultra cool toy, the AT-AT. I think my dad liked it as much as me. Also, notice another of my favorites, the lowly PDT-8 mini rig! 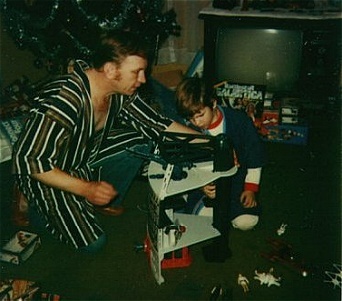 Christmas, 1978 I really do think my dad relived the childhood he never really had through me. He loved going to the movie to see the Star Wars movies with me and he loved every Christmas when he could "help" me with my new toys. Here, we put the finishing touches on my favorite toy of all time, the Death Star Playset. 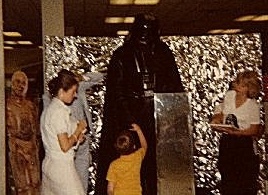 Summer, 1978 Darth Vader came to my local JC Penney and we could go and get autographed pictures and shake his hand. I'm quite sure it wasn't David Prowse, but being 6, I didn't want to ask the Dark Lord for his ID! What you can't see in this pic is that I have my Darth Vader necklace on as well as my favorite Star Wars t-shirt. When Star Wars came out, my best friend's parents and mine went out to see it. My Dad thought I might want to go, but my friend's mom said that it was not a kid's movie, that it was too violent. As early as the opening scene, my Dad knew I'd love it and he took me the next week. The rest is history. Star Wars...not for kids? bah!